Genevieve Simpson: EXPERIENCE: PhD SUBMISSION!!!! Last Friday a momentous event occurred - I submitted my PhD thesis. What was looking to be a pretty big anti-climax - a short stroll over to the Graduate Research School office to hand in a pile of paper - turned into quite the event. 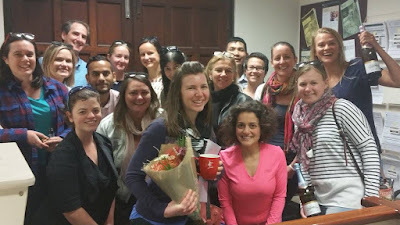 I can't help but be touched by all the support I received from my fellow postgrads who walked with me to the office and celebrated my submission with champagne. Thanks guys!